Meat is presented as a normal part of our lives. Doctors say that if we did not have enough protein, our body will suffer. But they do not tell us the story behind this – that our beautiful steak used to have eyes, a brain and feelings. The biggest problem is the amount of meat we eat. In the past, the only sources of meat were family farms. Now it is almost impossible to find one of these in the USA, and surveys say that less than 1% of animals killed for meat in America come from family farms (Foer, 2009). The reason for this is simple. They have been pushed out by bigger, faster, more economical ones. But these bigger farms are also inhumane and unethical. Still, money is money. Most of us have tried them. They are crispy, and the smell of them is almost impossible to resist. Most people don’t think of chickens as cute animals. For many of us, even a cow or a pig is cuter. 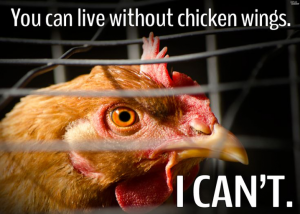 But a chicken, like other animals, can feel pain, just as people can. Farms try to save as much space as possible, and for this reason, most chickens never have the chance to stretch their wings. Often, chickens are kept in small battery cages with dimensions of 430 cm² (about A4 paper size), and these cages are usually stacked on 9 floors (up to 18 floors in Japan). The wire mesh of the cages causes suffering like crippled legs, feather rubbing and skin chafing. These cages are kept in big halls without windows, and the chickens, like other animals, are fed with specially modified feed which causes them to grow 400% times faster than is natural to them (Foer, 2009). It could be said that death is a liberation for them, but this is not a fairy tale. At the slaughterhouse, they are hung upside down while their already crippled legs are injured and broken and then their throats are cut open by machines and they are immersed in boiling water for feather removal. Chickens are often conscious throughout this process. A hen’s bones are brittle and using electric current would cause them to shatter, so often the chickens are not stunned (Mench; Siegel 2011). It is generally known that pigs are very intelligent animals. Animal right’s activists conduct secret investigations on animal farms, and their findings are horrific. Secret recordings show unstable beating and kicking. A pig’s life is no better than a chicken’s. Due to lack of space, pigs become stressed and bored (Kaufman, 2003). Like other farm animals, pigs are genetically manipulated and many of them become crippled by their own weight. They are social animals and bad treatment and abuse causes in them neurotic behavior such as cannibalism and tail-biting, so factory-farm workers use special pliers to clip off the ends of piglets’ teeth, and they also cut off their tails without anesthetic (Luce, 1995). Many people do not eat meat, some for ethical reasons, some for the sake of a healthy lifestyle. The only meat which many of them sometimes eat is fish. But is there a difference? Is animal farming different from fishing? 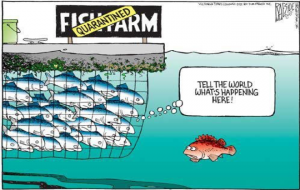 The demand for fish is increasing. Earlier, all we could find in shops was frozen cod, but nowadays the offer is much larger. Higher demand brings with it other claims on breeding. Forget the fishermen sitting by the sea. The reality is different. Fishing boats are able to catch 50 tons of sea animals at one time. For the sake of your delicious half kilo of shrimps, 12 kilos’ worth of other sea creatures, such as sharks, dolphins and skimmers, have to die. This is called the by-catch (Foer, Eating animals, 2009). But at least these animals have had the chance to live happily in the wild. For fishermen, it is more economical and easier to create special fish farms, where fish are kept in their natural surroundings – water. But this water is incredibly dirty and may cause eye bleeding. As we close, please ask yourself a question. Do I make differences between animals? Would I ever eat my own dog? Of course I wouldn’t. But is my dog different from a pig? Foer, J. S. (2009). 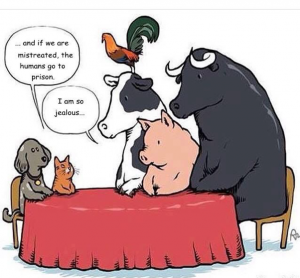 Eating animals. New York: Brown and Company. Kaufman, M. (13. August 2003). WHO Urges End to Use of Antibiotics for Animal Growth. Luce, W. G. (March 1995). Managing the Sow and Litter. Oklahoma Cooperative Extension Service. Mench, J., & Siegel, P. (2011, July 11). Poultry. South Dakota State University, College of Agriculture and Biological Sciences.